Anyone get R40 yet? if so how is it??? As long as it's not anything from R40. Some pretty poorly designed t-shirts for that tour. Dalmation spots set off your age spots? Sorry, I had to. Edited by Narps, 19 November 2015 - 08:48 PM. I still think Geddy has a lot of nerve keeping that Arf40 t-shirt all for himself. If we hadn't been the same age I never would have gotten away with that. Interests:Univ. of Nebraska, Rush, the Dave Matthews Band, the Seattle Mariners, the Dallas Mavericks, and baseball in general. This is 12 a.m. ET, no? For the first time in 30 years, I've decided not to get a Rush item on release day. All so the kiddies could get Daddy something for Christmas. I thought about that, but will probably just get socks,.. Better than coal in a stocking. Is that another Narps underwear reference? I'm not sure, I live in the central zone so I would imagine anyone in the eastern time zone will get it at 12 there and I'll get it at 12 here an hour later. Edited by DirkPrattLerxst, 19 November 2015 - 10:14 PM. If you ordered it online, there's a chance it could be delivered a few days early. Also, because of the internet there are other "ways" to get it a little before the release date if you want to. Interests:Rush and More Rush!! Collecting Rush Stuff!!! My Family! Best Buy finally has up on website the ability to buy and store pick up. The one with the flashlight and it is on sale!!!! The CD is already on Apple music. Just got to the office and am cranking it. "The Anarchist" is currently playing. Sounds awesome! My "stereo" at my office leaves a bit to be desired - so am looking forward to listening at home on a proper sound system. The vocal yodelling is atrocious and drums are somewhat muffled but apart from than that. Yeah, the yodelling is a given at this point. I can't really tell on the drums since I'm playing it on one of those "portable" docks. If that's the case, I'm definitely going to be a bit disappointed. That was the main problem on CA live, in my judgement. Headlong Flight is even worse for the garbled lyrics. Sounds like a yodelling contest for deaf people. I was able to pick mine up a few days ago (One of my local indie shops lets me get new releases as soon as they get them in). I haven't listened to/watched the whole thing yet (Especially since there's a crack going all the way through my CD 1 ), but generally speaking I like what I hear, and I love what I see. The cinematography is fantastic - definitely the best on a Rush release IMO. I know I've read elsewhere that people are unhappy with the heavy shift towards the blue end of the spectrum but that doesn't bother me, especially since this one has a nice consistent look across all angles for the first time since S&A (Time Machine's black levels were all over the place, and the shots on CA were not all cross-processed equally). The sound is excellent to me. Very clear mix, miles ahead of Clockwork Angels. The 5.1 mix on the Blu Ray could be more engaging - probably 95% of the mix is coming from the front speakers; the rear speakers only offer up crowd noise when there's a significant amount, and room echo the rest of the time (But it's quiet enough you won't even notice it unless you're right up against your rear speakers). Even if it's not an engaging mix, it still sounds excellent. My biggest gripe however is their reluctance to touch up some trouble spots in some of the songs. There's some really rough spots; Alex starts Far Cry on the wrong chord (It takes about 4 hits for him to fix it), Neil completely drops the beat coming off his first fill in YYZ during the trading bass/drum solos, and Alex lands on the wrong chords for a few seconds during the galloping part of the 2112 Overture. There may be a few others, but those are the ones I remember offhand. I'm not suggested they should've doctored the performance until it was absolutely perfect, but I think those are some pretty glaring problems. Especially considering something similar happened on Time Machine and not only did they fix it with a performance from another night, but made it glaringly obvious they did so in the liner notes. It's not enough to ruin the release for me or anything, but I am definitely scratching my head over it. That's somewhat disappointing to hear considering I was gonna go out and get it today. The Roll The Bones performance they seemed to fix up during Alex's solo which he flubbed terribly that night and it sounds fine on the final release. That made me think they would clean the performances up a bit but sadly I guess not. I'm scratching my head over why they'd fix that and not the rest of the rough spots they had both nights. Edited by PolarizeMe, 20 November 2015 - 09:29 AM. 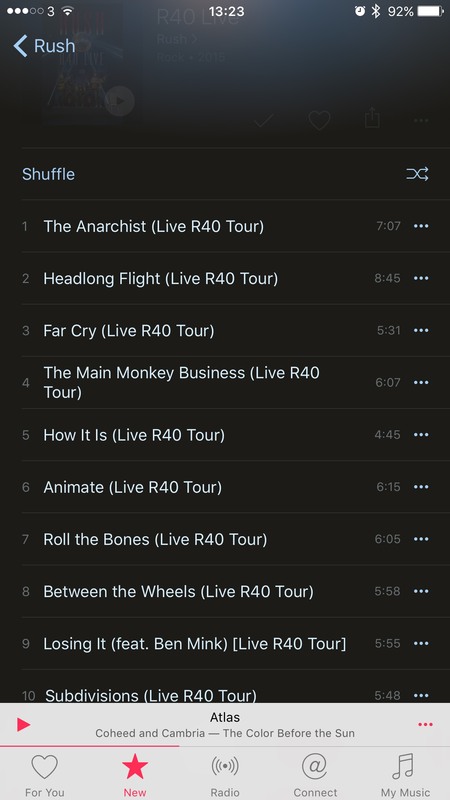 I am right now listening to the itunes version of R40 Live even thou I have pre-ordered the CD/Bluray/T-shirt from Rush website, but I just couldn't wait!! Edited by YYZumbi, 20 November 2015 - 09:35 AM. According to this thread you're not the first person to say this about iTunes version. I'm sampling through some of the tracks right now and the mix does seem to be a hit and miss as well. I'm gonna pick up the CD/BluRay at Best Buy today and hopefully the mix on the CDs don't suffer the same problem. mmm... good. I hope its correct. My Blue Ray and CD will be at home waiting for me (Amazon Prime I love you). Tonight we get well medicated and slip the Blue Ray disc into my PS4, put on my sony gold 7.1 headphones and relieve the tour!! !